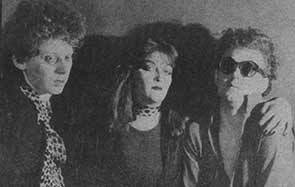 Anti-Social was a UK Punk Rock band from Birmingham, United Kingdom, formed in 1977. They released one single, Traffic Lights/Teacher Teacher on Dynamite Records DRO1 that is now one of the rarest UK punk record releases and was included in John Peels legendary Record Box. They became nationally infamous by advertising for someone to commit suicide live on stage for which the band would pay them £15,000. In 1974 Bass player Matt Smith joined with Robert Fern Vocals/Guitar (a classmate of Black Sabbaths Geezer Butler) and Johnny Harrison on drums in a band called Maniac they later changed their name to Anti-Social. After gigging for a while they recorded what would later turn out to be one of the rarest UK Punk Rock releases `Traffic Lights` backed by `Teacher, Teacher` at Outlaw Recording Studios in Birmingham released on the Dynamite Label (DR01) in 1977. Paul Morley reviewed their single in NME in January 1978, calling it “archaic rock song sneered with incongruous, but violently necessary contempt.” Matt Smith left during these sessions (now married to Carolyn Spence who worked at UK`s Sounds (magazine)) Matt felt that the constant aggression associated with the band was no longer to his liking and was replaced first by Paul Cooper and then by Gabrielle Fern. Their label manager Bob Green decided to offer £15,000 for any volunteer who would committ ‘suicide’ live on stage via a guillotine, fortunately no one took up the offer, the Department Of Public Prosecutions was less than amused and the band was arrested. Band Manager Les Hemmings died in a car crash in the 1970s, while delivering copies of the single to various shops. The Studio Recordings to their follow up single were stolen and their flnal gig (at the Kingshurst Labour Club) ended with drummer Harrison playing a drum solo on old chap’s head, an offence for which he was later arrested and charged. He phoned Rob Fern the next day to inquire as to whether he was still in the band Fern replied, “There is no band”. The 7 inch record now sells for upward of £500 and has thus led to bootleg copies swamping the market (easy to recognize as they have the release date of 1978 instead of original 1977 and have incorrect label credits). A new official reissue with the agreement of Robert Fern with foldout sleeve and an extra track recorded in 1980 will be released in two months on Cameleon Records in France. Where is this reissue ordered from. Can it be pre ordered? Is the extra track sun arise? Available maybe april 15,I hope. No pre-order and yes, it’s Sunarise on extra track. Hi, Paul Panic = Paul Cooper ?